Apple on Tuesday refreshed its consumer iMac computer, with new 20-inch and 24-inch models. The single 20-inch iMac model features a 2.66GHz Intel Core 2 Duo processor (Apple previously offered both a 2.4GHz and 2.66GHz configuration), 2GB of 1066 MHz DDR3 memory (with a new maximum of 8GB for all iMac models), a 320GB Serial ATA hard drive, and Nvidia GeForce 9400M integrated graphics with 256MB of DDR3 SDRAM shared with main memory (previous 20-inch models had discrete ATI Radeon graphics). The 24-inch model comes in 2.66GHz, 2.93GHz, and 3.06GHz Core 2 Duo configurations (compared to 2.8GHz and 3.06GHz in the previous generation), and with 4GB of 1066 MHz DDR3 memory (twice the amount included before), and a 640GB or 1TB Serial ATA hard drive. The 2.66GHz model has the same Nvidia GeForce 9400M integrated graphics as the 20-inch model, the 2.93GHz model uses the discrete GeForce GT 120 with 256MB of GDDR3 memory, and the 3.06GHz model uses the discrete GeForce GT 130 with 512MB of GDDR3 memory (you can also configure the top two models with the ATI Radeon HD 4850 discrete graphics processor, with 512MB of memory). 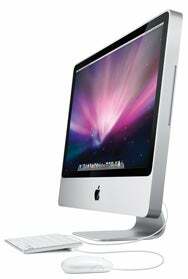 All iMac models come with a glossy display with a built-in iSight video camera, a mic, and speakers. The new iMac also includes Apple's Mini DisplayPort connector, built-in AirPort Extreme 802.11n, Bluetooth 2.1+EDR, Gigabit Ethernet, a total of six USB 2.0 ports (including two on the Apple Keyboard), and one FireWire 800 port. The new iMacs are available immediately and cost $1,199 for the 20-inch model and starting at $1,499 for the 24-inch model. The new iMac exceeds Energy Star 4.0 requirements and is an early adopter in the industry for Energy Star 5.0 compliance. The iMac enclosure is made of recyclable aluminum and the interior is designed to be more material-efficient. The iMac uses PVC-free internal cables and components, and contains no brominated flame retardants.